I didn’t’ t go to the flea market in a very long time, maybe since November? It was a cold and busy winter and I didn’t have the energy or the motivation to go, even if it is one of my favorite things to do. But this Sunday was nice and sunny. It was a very good flea market day, with some good finds for my collection, with some relaxing time walking around and looking at stuff and also with some friends met there. An antique gold plated locket in a very good condition, with the two photos (of mother and sun, maybe) still inside under the clear celluloid). It’s my new favorite from my collection. An old pocket watch winder that I’ll wear as a pendant. A glass brooch ( I think it’ from the forties). This unidentified thing (maybe some fastening for a jacket?). I don’ t know what I’ll use it for, but I liked the acorn like shape and it was very cheap, of course. An old wood and brass knitting doll for my collection. And a pretty silver ring. These are some new additions to my mismatched jewelry collection. 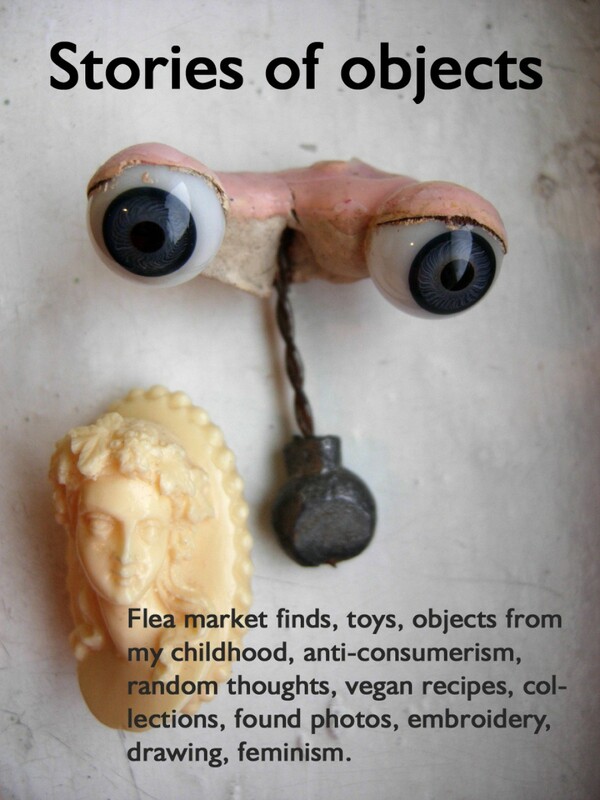 I especially like the creepy bakelite and silver hands, very cheap finds. I’m sure the bakelite brooch is vintage, I’m not certain how old the silver pendant is, although it was looks like it was used for a long time by someone. When I bought it, I thought it might be antique, but I’m not sure.I like how the bead looks like an apple. I’ve also found these two beautiful old silver bands, an Art nouveau pewter ring and a celluloid owl ring. This very small and detailed charm is for a bracelet I want to make at some point only with animals and birds. Linking up with Vintage Bliss Tuesdays and Vintage Charm parties. I have this celluloid pendant since a long time, now but I have recently rediscovered it in one of my boxes. I like to wear it on a silver chain. It is even nicer in reality, with inner layers that imitate amber catching the light. Like a little piece of sunset around my neck. I have already posted at some point the smaller and older snuff box, but yesterday I have found another one at a vintage boutique. It’s not so pretty like the older one (that also has a celluloid sheet inside), but I like this one because an year (1941) and a place (Lagan) is scribbled on it. I’m not sure what’s the meaning of the inscription (I have searched it in Swedish and “Frans ny” would supposedly mean “the new fringe” that doesn’t make much sense to me), but who knows… maybe the translation is not right. Or, it could have some relation to the war? 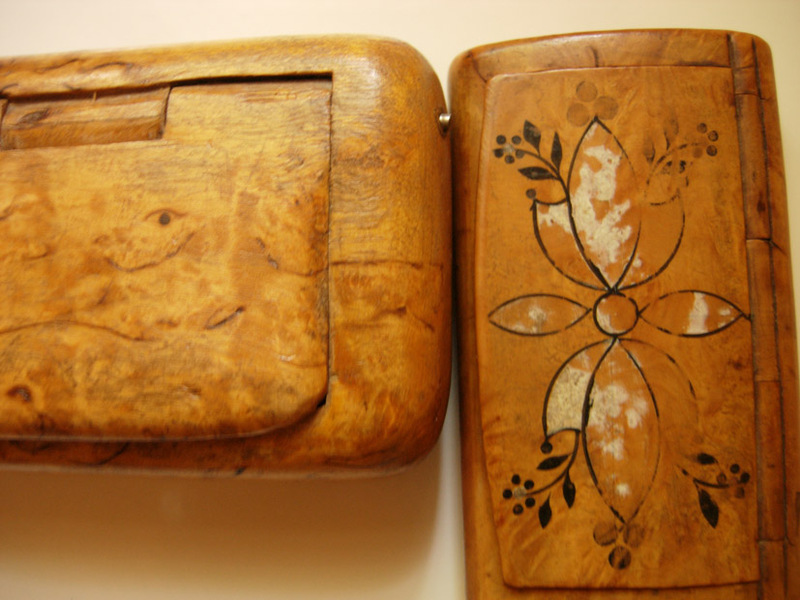 Or, it could just be a private joke of the person who had this snuff box 74 years ago?